Burning of the Union Depot During the Railroad Riot, July 21 and July 22, 1877, Pittsburgh, PA. 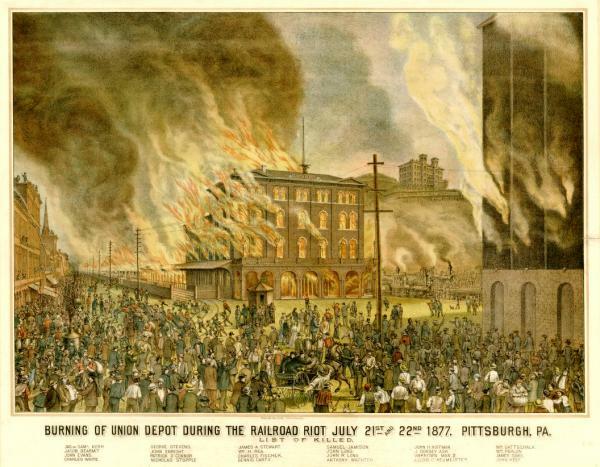 The first nationwide wildcat strike in American history, the Great Railroad Strike of 1877 was most deadly and costly in Pittsburgh, where workers and their families battled with state militia sent from Philadelphia. Persuaded by Pennsylvania Railroad President Thomas Scott, Pennsylvania Governor John Hartranft requested that the federal government send troops to end the fighting. Concerned about the great power of the railroads, Hartranft later called for the recognition of labor unions.